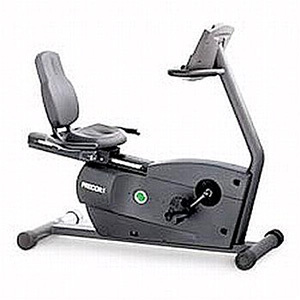 The C846 Recumbent Bike is self-powered and cordless with a battery back-up to eliminate downtime.The 846 features a simple, sturdy design with a smooth, comfortable motion, ergonomically correct design that fits a wide range of body types and 20 resistance settings using a magnetic, no-contact alternator resistance system to give a consistently smooth workout. The user-friendly programmability and electronic displays on the C846 offers the same easy to follow courses and features that exercisers rely on in all Precor products. The C846 offers facilities an aesthetically pleasing, consistent look with exceptional performance and dependability. Steel Frame: Durable, steel frame performs solidly and resists rust. Drive System: Double step-up drive system creates a smooth, comfortable motion and quiet operation. 20 Resistance Settings: Adjustable pedals fit a wide range of shoe sizes and low-profile crank arms ensure unrestricted movement. Handlebar positioning accommodates a variety of hand positions. Sweat-resistant foam padding stays dry and soft. 5 Programmed Courses: Cross Country, Weight Loss, Interval and Hill Climb. Quick Start Key: A single key puts exercisers into the manual course.